Thumb Direction: Set the ordering direction for the small images that make for the album's thumbnail in the listing. Show Albums Tags: No / Yes - choose whether to display the tags used for creating the albums or not. Preview block resolution: Specify the album preview's resolution. The height will be generated based on the width and vice-versa. 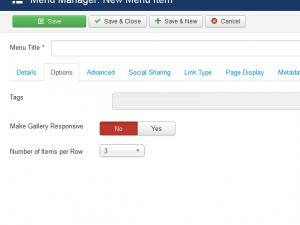 You have the possibility to set a Number of Items per Row was introduced and the Make Gallery Responsive option will render the items displayed by the menu item as responsive. 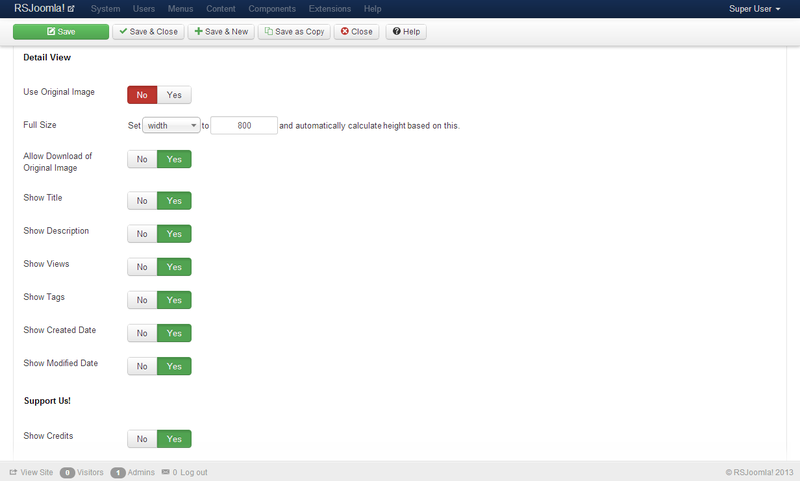 These two settings are being used in conjunction, meaning that Number of Items per Row will be taken into consideration only if Make Gallery Responsive is enabled. 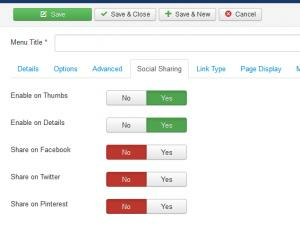 The Facebook, Twitter and Pinterest sharing buttons that are associated with each image thumbnail generated by the Albums Layout menu item. You can read more about this below, in the Social Sharing section. Thumbnail Size: specify either the width or the height of the thumbnails. Note that this does not affect the uploaded images (just how these are displayed). Order Images By: Free ordering / Title / Description / Hits / Created date / Modified date. 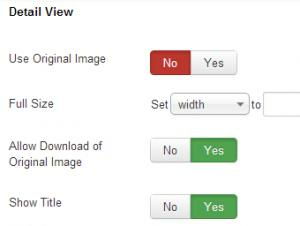 Images that compose album thumbnails (in the Albums view) will be ordered based on this setting. 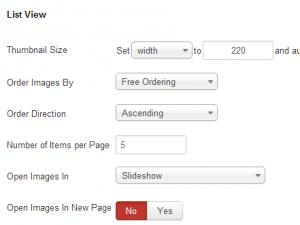 Number of Items per Page: How many image will be displayed per page. Open Images In: Slideshow / Detail page / Go to URL. When an image is clicked, this action will be triggered. Open Images In New Page: Yes / No. Show Title: Yes / No. Show Description: Yes / No. Loading Bar: None / Right / Left / Up / Down - Displays an Youtube-like loading bar. 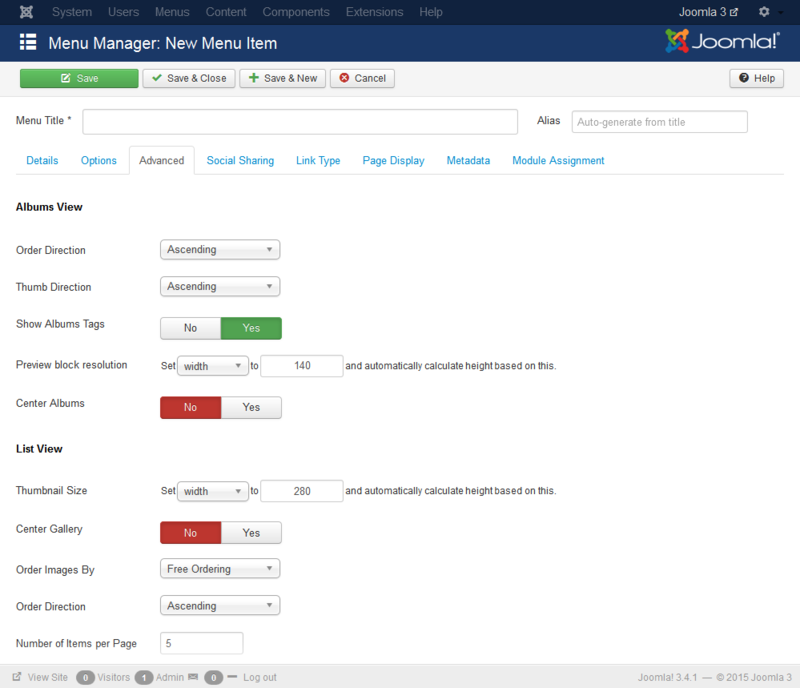 You can choose one of the available positions for it. Set to None in order to disable it. There is the possibility to set a Number of Items per Row. 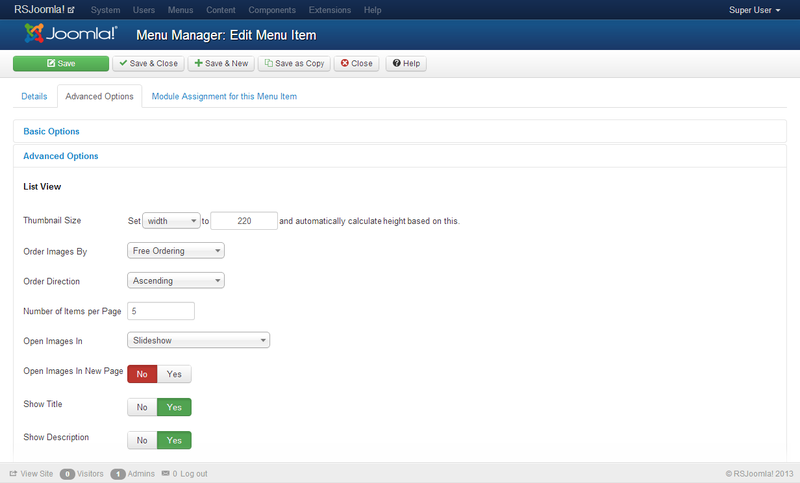 Also, the Make Gallery Responsive option will render the items displayed by the menu item as responsive. These two settings are being used in conjunction, meaning that Number of Items per Row will be taken into consideration only if Make Gallery Responsive is enabled. The Facebook, Twitter and Pinterest sharing buttons are associated with each image thumbnail generated by the Gallery Layout menu item. You can read more about this below, in the Social Sharing section. Use Original Image: Yes / No. If set to Yes it will show the full original image instead of the higher resolution crop. Full Size: specify either the width or the height of the full images (eg. when the user clicks on an image). Allow Download of Original Image: Yes / No. Show Views: Yes / No. Show Tags: Yes / No. Show Created Date: Yes / No. Show Modified Date: Yes / No. Show Credits: Yes / No. 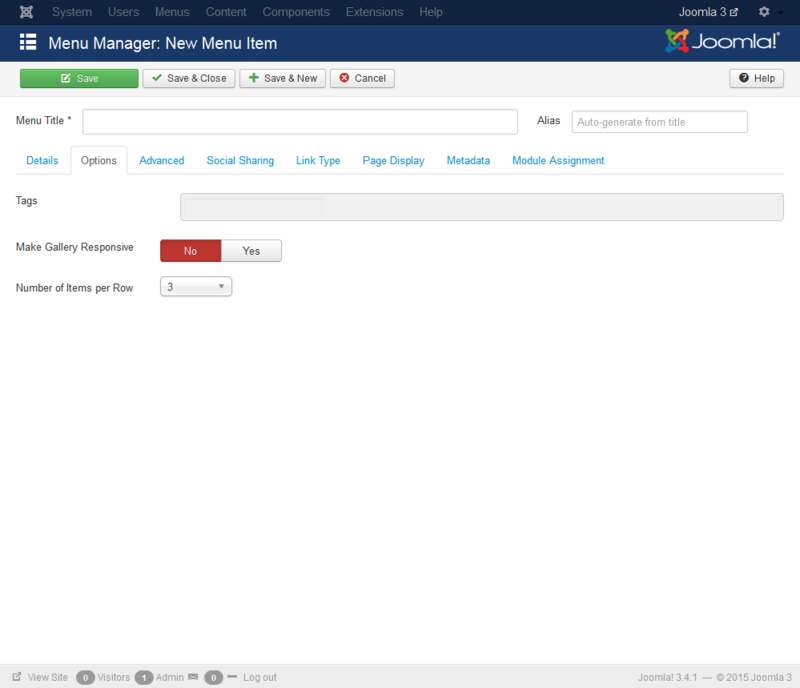 By setting this to Yes, you can support RSJoomla! by placing an anchor that links back to our site. If you wish to see an example of how the Gallery layout menu item looks like in the frontend, please visit the RSMediaGallery! 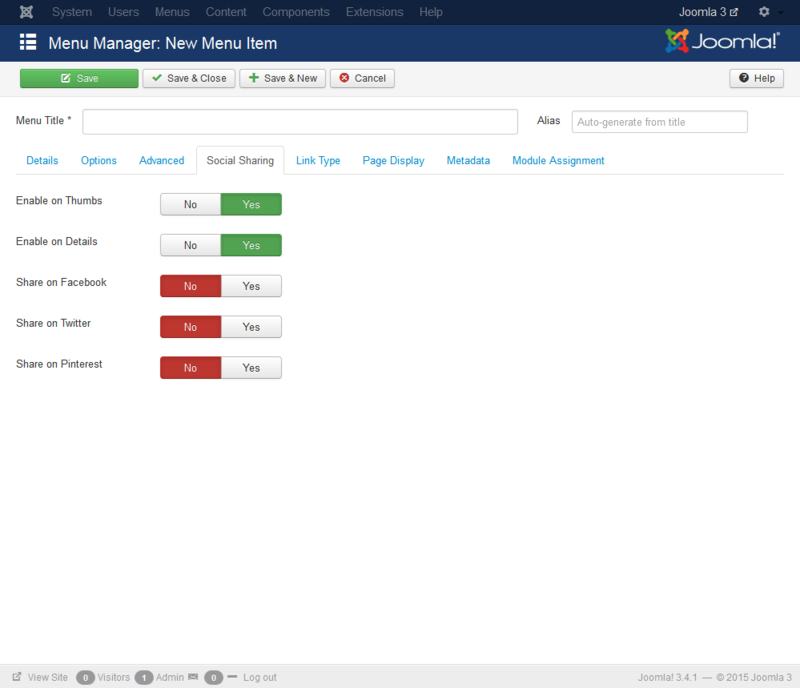 Screenshots section.